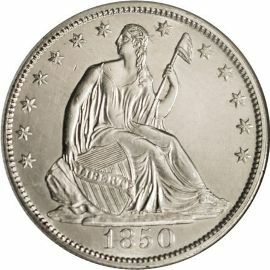 Seated Liberty Half Dollars (no Motto) were coined at the US Mint from 1839 to 1866. These silver coins were designed by Christian Gobrecht under the order of Mint Director Robert Maskell Patterson. The design was changed partially due to the introduction of the steam press in 1836. This new way of making coins was much more efficient than the old screw press which took five men to operate. Cap on top. The date is inscribed below the figure of Liberty and thirteen stars surround the entire design. This basic motif was used on all silver coins of this era with the exception of silver three cent pieces. The reverse shows an eagle with wings spread as its central device. The eagle has a Union shield superimposed on its breast and is clutching arrows and an olive branch in its claws. 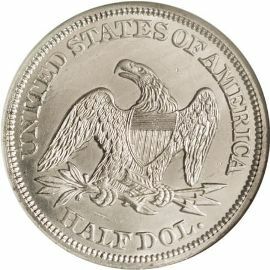 The inscription "UNITED STATES OF AMERICA" is on the upper half of the coin and the denomination "HALF DOL." is on the lower half.